Gessell describes Marie-Jeanne Musiol's images by saying "The black circles are like black holes in space that drain the life force from all those who pass." Gatineau artist Marie-Jeanne Musiol has created an art installation that invokes the ghosts of the Auschwitz-Birkenau concentration camp in Poland where thousands of Jews were slaughtered during the Second World War. 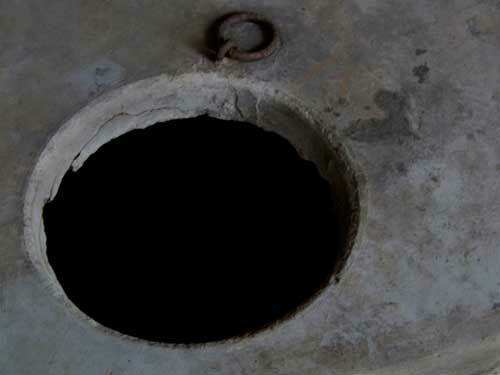 Visitors walk into Pierre-Francois Ouellette Gallery in downtown Montreal and immediately see three dozen photographs, each of a round, black hole in a rough, deteriorating cement base. The recorded sound of an eerie whistling wind blows through the room. The life-sized photographs are of holes, 13 inches in diameter, in large, communal latrines in the Auschwitz-Birkenau camp, as the desolate, uninhabited scene looks today. The photographs are arranged on the wall in a pattern similar to the repetitive latrine holes in the cement.